The book starts with the fascinating journey of 74-year old Deborah Thiagarajan, who created DakshinaChitra and ends with 29-year old Likitha Bhanu of Terra Greens Organic. The others include Poonam Natarajan of Vidya Sagar, Vandana Gopikumar of The Banyan, Ranjini Manian of Global Adjustments, Nalini Shekar of Hasiru Dala and Padmashri Shanthi Ranganathan, whose name is synonymous with Asia’s first de-addiction centre, the TTK Hospital. 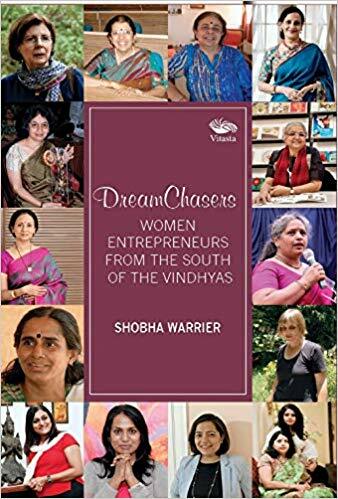 Also featured are Sheela Kochouseph Chittilapally, who runs V-Star–a household name in Kerala, Radhika Menon of Tulika Publishers, Saloni Malhotra of DesiCrew, Svati Bhogle of Sustaintech India, Sreeja Arangottukara of Paatasala, transgender activist Kalki Subramaniam of Trans/Hearts and Sabriye Tenberken of kanthari. The remarkable stories of these entrepreneurs point to one thing: With dedication and hard work, anyone can achieve even the unachievable and that gender has no role to play in it. A must-read for all budding entrepreneurs.